Ancient Aliens has returned. This week, History announced the TV show will return with new episodes in April. 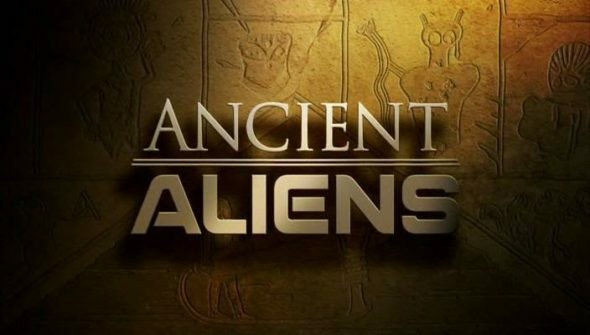 New episodes of Ancient Aliens premiere on History on April 27th at 9 p.m. ET/PT. NEW YORK, NY – March 29, 2018 – HISTORY’s hit series “Ancient Aliens” returns with a two hour premiere Friday, April 27 at 9PM ET/PT in its continued global search for proof that extraterrestrial life exists and these unknown lifeforms visited Earth thousands of years ago. If aliens are among us, how have they impacted our world and how will people react to this discovery? From recent breaking news on the U.S. government’s funding of UFO research to recently discovered hidden facts behind chambers in Egypt’s Great Pyramid, each new episode covers various alien-related topics with historic detail, first-hand accounts and interviews with the world’s top scientists, archaeologists and researchers. What do you think? Are you a fan of Ancient Aliens? Will you watch the new season? More about: Ancient Aliens, Ancient Aliens: canceled or renewed, History TV shows: canceled or renewed? I’m a fan of Ancient Aliens. It’s a wonderful view of some phenomenal landscapes together with alternative ways to consider historical artifacts. I’m familiar with a lot of the sites and artifacts from a minor in Art History – but most back then were seen as religious artifacts. So the content is compelling – would be better if they lost the cheesy and repetitive “alien researchers believe….” language. I am an avid fan of Ancient Aliens but for the last two seasons they have only done 2 hour shows (back to back episodes) and its basically re-hashed info…..nothing new. I am so disappointed with the series. I love this series but my cable company has it on H2 which I do not get. I am so hoping that the new episodes will be broadcast on History and not only on H2! I thought that H2 changed over to Viceland. At least they did in Nevada.